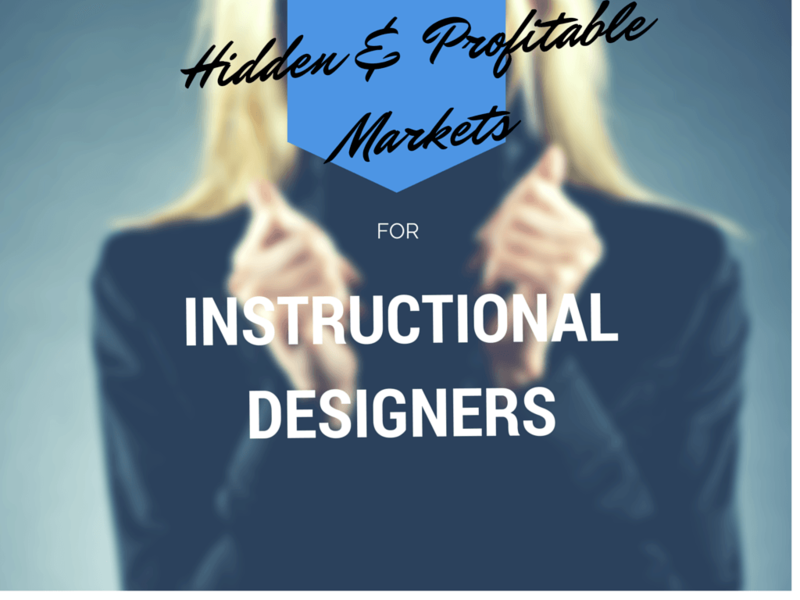 There are hidden and untapped markets just waiting for eLearning instructional designers. Here’s where they are and how to tap into them. But there are some untapped, yet highly lucrative markets that are under the radar of most instructional designers. Here are the top three most lucrative, yet untapped or hidden markets for eLearning instructional designers. Courses with content created by high-profile financial, stock market, real estate, sports, entertainment and entrepreneurial celebrities. Such celebrities are just starting to dip their toes into the online course movement. Why? It enhances their professional platform, and gives them a passive income source. Most instructional designers are completely unaware of this market. But it’s starting to get some real traction among celebrities who have a skill, talent, or specialized knowledge that is recognized and respected by the general public. The direct approach is best. Simply contact the celebrity and make your pitch. How? Create a sample module to give the celebrity a taste of what their course will look like. Then, contact his or her agent or manager or, in some cases, you can contact them directly. Some celebrities are open to pitches; others are not. We have found subject matter experts who have their own TV shows or columns in high-profile news outlets are the most receptive. Celebrity courses provide a much more sustainable income that typical corporate eLearning programs because, if you set up the terms properly, you can get a percentage of the gross profit for each course sold. It’s a good idea to schedule the course release to coincide with a tour, new product release or new TV appearance of the celebrity so that you can get more bang for the marketing buck. Regardless of any special appearances, if you are good at course marketing, you won’t have any trouble selling a lot of the celebrity courses. But the key here is that you need to provide the marketing and promotion services, in addition to the design services. The celebrity is your subject matter expert; you are the designer, developer and marketer. These are interactive games that challenge players on some educational topic related to the show or movie. Imagine an HGTV online school for interior decorators, or a DIY course on home remodeling, or a Science Channel course on the solar system. Do some digging to find the right contact, then make your pitch. Finding the right contact varies from show to show, and media company to media company. For example, if you want to make a pitch to TLC games, you’d go to the parent company’s producer’s portal and submit your idea. Several TLC shows have their own educational games, such as Cake Boss, Hoarders, and Say ‘Yes’ to the Dress. And, of course, movie franchises have been in this game (pun intended) for some time. One of the most popular movie-themed game sites is based on Disney’s mega hit Frozen. These games and courses are mostly free. Why? Because they are powerful branding and loyalty-building tools that keep viewers going back to the shows and movies they represent. Although instructional designers may not be able to get a percentage of sales if the games are offered to the public for free, designers with high-end gamification and programming skills are paid handsomely to create these offerings. You won’t likely get these gigs without a strong portfolio showing your experience in creating games—or at least developing game concepts—as well as some programming and animation chops. But a few instructional designers without these skills have made some good bucks just by pitching game ideas and storyboards to the show and movie producers, although this is the more rare route to break into this market. Still, if you have the passion and a great game idea based on a show or movie, show some moxie and make the pitch! Pretty much any adventure sport you can imagine is fair game for a course or experiential game. Look for companies that cater to adventure-seekers and outdoor enthusiasts, such as North Face or GoPro. The leaders in this space are REI and GoPro. REI has already created its Outdoor School to teach skills like kayaking, snow shoeing and outdoor photography. But a company like GoPro could also offer online courses on “high adventure” photography to cater to the adventure enthusiast. (They already offer a “Tips and Tricks” series of tutorials with their GoPro Athletes series, but there is so much more they could be doing with this!) The possibilities—and the corporate opportunities—are endless. If you love the outdoors or adventure, you could make money creating courses about topics you love. The benefits to the companies are, of course, is creating brand loyalty. The overriding message here is that to tap into these markets, you need to go after them! This isn’t a case of putting up a website or doing some social media marketing and hoping these markets will come to you. They won’t. You need to be proactive. And what better time than the start of the New Year to go after these fun and exciting markets!